For the last few months I've been building an imperial lookout tower. 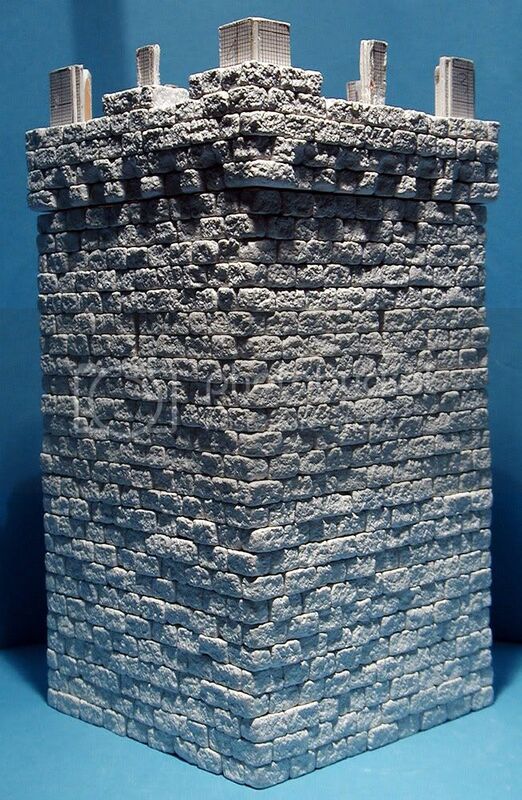 This model is completly scratchbuild with homemade stones, build brick by brick. Materials used: dentals plaster, PVA glue, foamboard (and some tools). It's almost completed, but still lacks floors, doors and other smaller elements as well as two rows of stones and some finishing pieces that go on top of the platform. The building itself is hollow, so it's pretty light and can be easily moved. It comes in two pieces, the lower bigger piece, and the upper platform piece. I wanted to make a mold based on this piece but I can't find anyone who makes professional molds in my area. Well done! I really like the look of the block by block construction. I take it you have a rubber mould, like the Hirst Arts moulds or similar? Have you used just PVA to glue the blocks together, or have you pinned/fastened them as well? The only comment I would make, is for my personal taste I would have arrow slits about 2/3 of the way up. But hey! 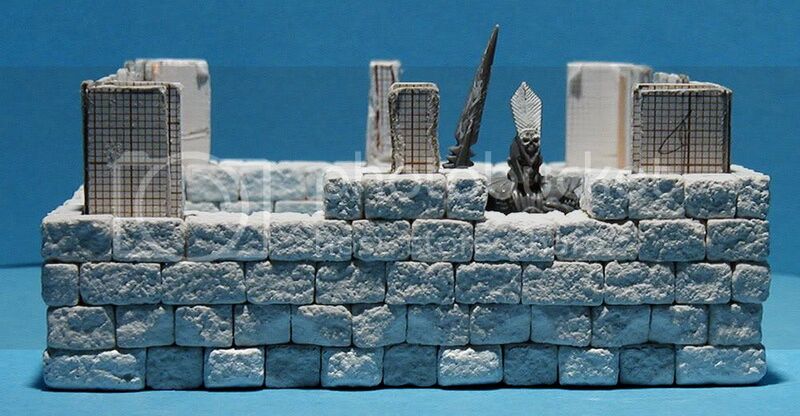 who am I to criticise - I'm too embarrassed to show my painting or terrain building skills (or lack of). 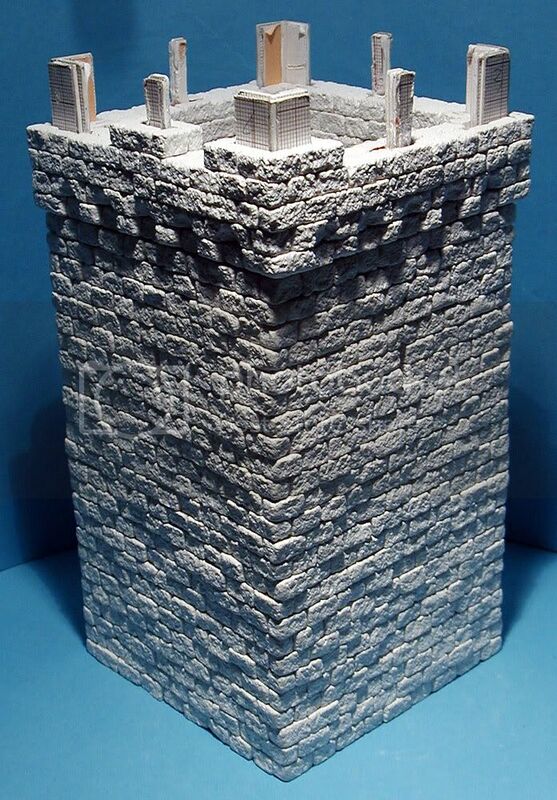 Very nice.Depending on how difficult it is you should make a few more towers and a low wall.A potential Empire outpost. Wow That is outstanding. How do you make the blocks? Wow, lots of towers recently! This is really nice, be sure to post photos of the finished piece when its done! That looks terrific! What's the process you used to make the stones? Certainly a labor of love. If you were inclined, you might want to make your own 2-part latex mold of the finished lower tower section before you paint it. 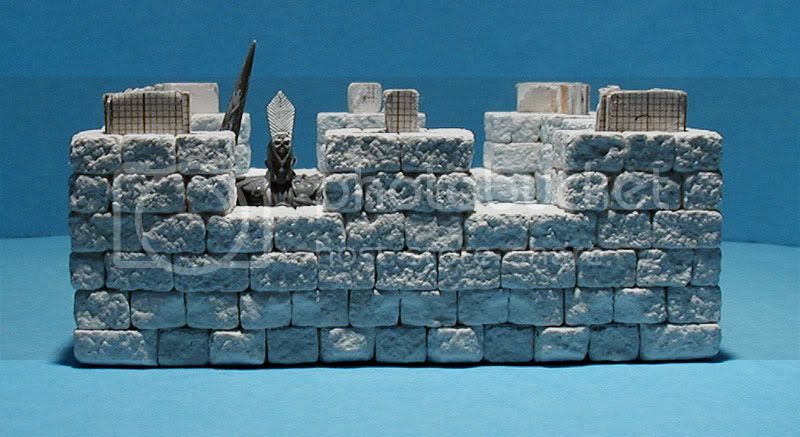 That way you can quickly cast up duplicates of the entire section as a whole to make a city wall or the like. Making your own latex molds is very easy, and yields great results. You could put a rectangular/cube-like hunk of styrofoam in the core of it when casting to reduce weight. You can mail order mold rubber from the net pretty cheap. Brick by brick? Hats off to you. I would have bailed on that project before the 3rd row. Good job! Nice! I really like the natural look of the tower. It's sooo real! Heathens! I shall smite thee! Right after my lunch break. 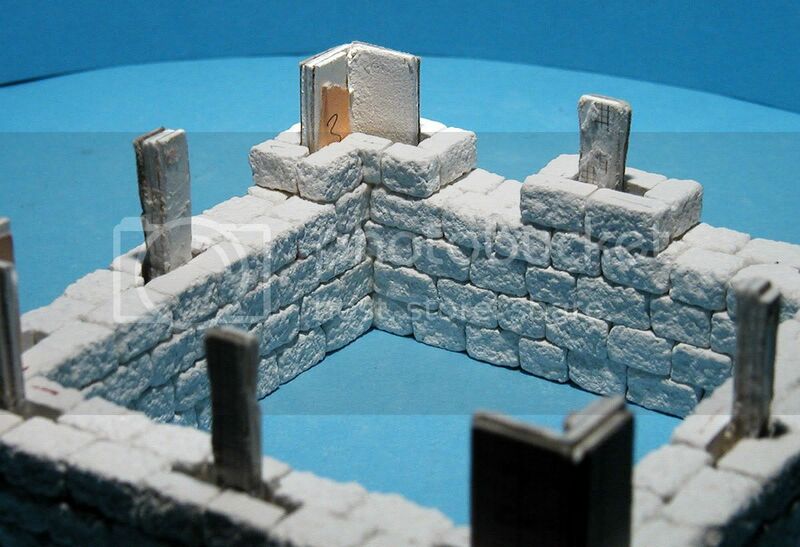 Triturian: Yeah I made a mold to make the construction faster, the whole piece has around 800 stones, so making each one by hand would mean madness:) They are glued together using PVA glue nothing more, I might fill bigger holes with some wall filler. If you look closely you will see arrow slits in the 2/3 of the bottom piece hight. 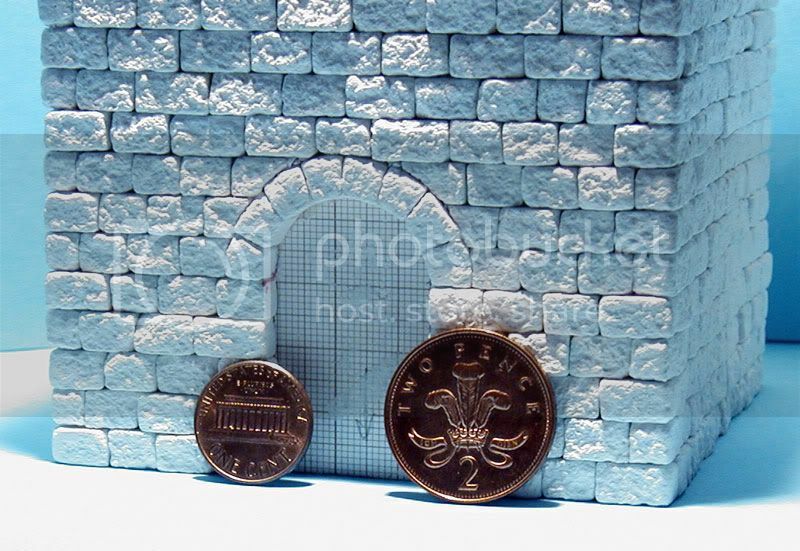 jack: it's really time consuming, might be boring and I don't think I will do anything like this anymore, I might try making something smaller, or casting a small wall panel to make things faster. 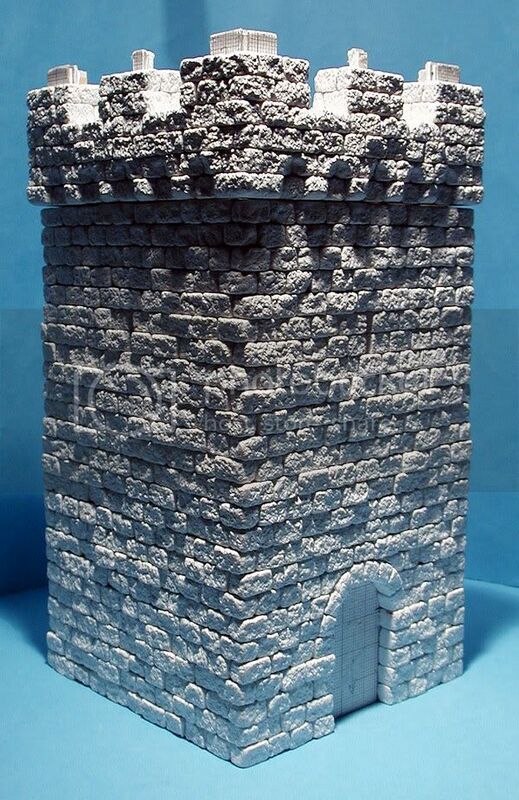 Marcus: Your tower is also amazing mate:) I create my stones using small dental plaster casts and a rock. I press the rock against the surface of the cast to add texture to it. Pretty simple, effective but can take some time. PygmyHippo: For making stones check above. As for the mold, it's not so easy. I mean it is easy to make, but when handling big objects like this, you need a lot of RTV silicone to make a mold. I thought about making a brush-on mold, but it is also a bit expensive. Plus I'm a bit scared that I might destroy this piece when making a mold, rubber might stick really easily because the original piece is out of plaster and is porous. I'm still trying to find a professional who might do this for me. lack0fbettername: check somewhere above for the description. I will post some new photos soon. Purge the heretic, the gunline, the cheese-hero. Terrific work, bravo! I'd never have the patience for something like this. We fight, and we win through strategy and determination. We are civilised, cosmopolitan, and wear cod-pieces. Bring back the location feature! Very nice indeed! 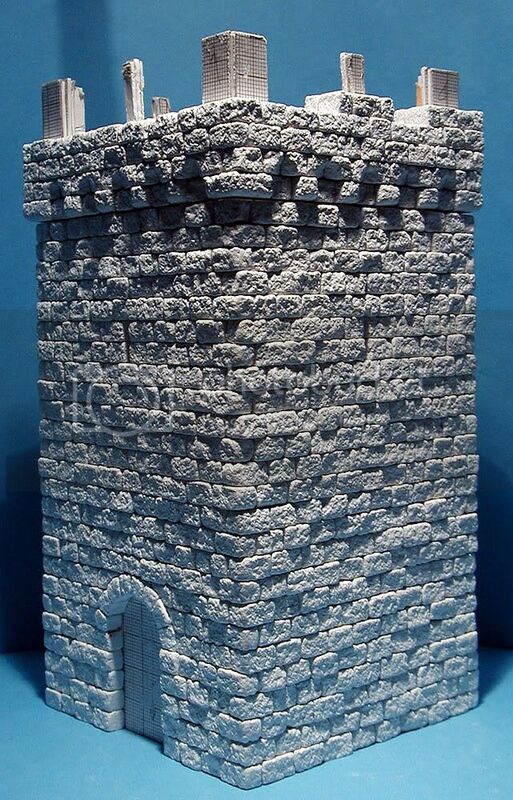 My only criticisms are that the corners of the tower should perhaps be made into more smooth 90 degree blocks, as they are the bit that erodes quickest and therefore were usually finished to a higher standard in the castles/towers I've seen, but it does depend on the style/age of the tower. Also the arrow slits could perhaps be emphasised more as there would be very little light in that thing. 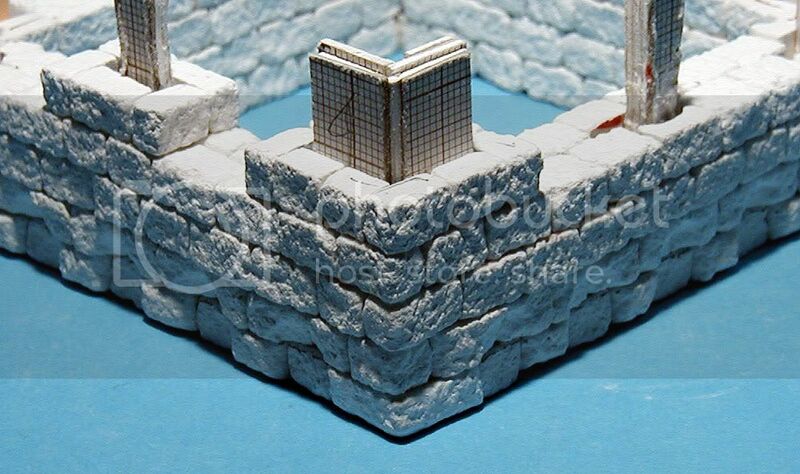 Also the slits would probably have a supporting larger stone above and below, to prevent it collapsing. Very good job otherwise though, I love the texture of it. And a question, does it have anyway of getting inside, as firstly it would look very cool to have an abode within with various objects or people and secondly you could practically use it to put troops in during games if it is was. Duel until death does part you from this life! Gutsy: thanks for your kind words:) it is pretty hard but looks cool in my opinion, so yeah I guess I can see it is worth it. Melvin: yeah you need a looooot of patience to build it, especially when you need to lay around 1300 stones (that's the number of stones used in this project). Also Hooray from me mate:) Glad to hear that there are more 3city members here. Duellist: I'm glad that you like the tower:) I was really going for a "pretty old but still standing and can be used" look, that's why it's corners are a bit uneven. The slits are around 3mm wide which is 20cm wfbwise (assuming that a 28mm is 180cm "in reality"). Not much but gives good defense (really a "can't see me but I'm shooting at you" kind of arrowslit:) ). There are bigger stones below and above each arrowslit (wider not higher). I've seen many versions of arrowslits and some had much bigger supporting stones and some used normal stones for support, I've decied to go with that second option. I just have to add some finishing stone pieces on top of the merlons and I can start adding wood elements. Wow, that is looking really good. Seems to be dead on for scale with model you show, nice job. Are you going to put watchtower roof on it now?